After a two-year delay, NASA has given the green light to Juno, a $1 billion, solar-powered mission to Jupiter. Juno was originally set to launch as early as 2009, but budget constraints delayed the next step in the probe's design. Now, funding had been approved to build the spacecraft, the agency announced on Monday. Juno will launch from Cape Canaveral, Florida, in August 2011. After reaching Jupiter in 2016, it will orbit 32 times over the course of its year-long mission. Juno will be the second orbiter to study Jupiter. The first such probe, Galileo, circled Jupiter's equator for almost eight years before plunging into the Jovian atmosphere in 2003. Juno, on the other hand, will take up a polar orbit around the planet, skimming the poles at an altitude of 5000 kilometres. This trajectory will afford the spacecraft a view of unseen parts of the planet. The probe will also fly between Jupiter's atmosphere and the intense radiation belts that girdle the planet. In the radiation belts, streams of charged particles could darken the glass covering the probe's solar panels, limiting their capacity and limiting the probe's lifetime. Juno will carry a suite of 11 science instruments, some of which will be used to measure the planet's gravity, magnetic field, and chemical makeup. "We're really looking at composition," says principal investigator Scott Bolton of the Southwest Research Institute in San Antonio, Texas. "We're going after the ingredients of Jupiter so we can reconstruct the recipe." Since oxygen is the third-most abundant element in the universe and in the Sun, many planetary scientists expect to see a fair amount of water in Jupiter. But Galileo's atmospheric probe, which entered Jupiter's atmosphere in 1995, saw little evidence of water. "The Galileo probe was expected to measure water, but it failed," says Dave Stevenson of Caltech. Some suspect little water was found because the module descended through a dry patch in Jupiter's atmosphere. Juno will attempt a more global search. The probe will use radio antennae to measure light absorbed by water and ammonia at six different depths in the atmosphere. If water is present, it could fill out the picture of how the planet formed. Since water ice is thought to dominate the dust content in the early solar system, "the water is a tracer of the solid material that was added to the planet", says Stevenson. Coupled with measurements of the planet's magnetic and gravitational fields, scientists could begin to build up a working model of the planet and put constraints on how it formed, Stevenson says. Jupiter's gravitational field will be mapped by detecting how the planet's tug influences Juno's velocity. Those changes will be measured by looking for shifts in the frequency of signals passed between the spacecraft and the Deep Space Network, Earth's international array of radio antennae. This image shows the planet Jupiter itself (in red) surrounded by the disk of electrons (in blue). Because of an interaction with Amalthea, a minor moon of Jupiter, the disk thickens near the planet. Here's a very nice .gif movie of the Jupiter/Io torus. You have to click your "Reload" button on your browser to keep it going. MGmirkin wrote: Well, according to Wikipedia, 2 trillion watts is 2 terawatts. So, does that mean the voltage potential in the interaction is 2 million volts? Perhaps Io has less gravity. That is, less gravity than it should, for its mass and size. Having read a bit more since then... In order to maintain such a circuit over time, an external driving force would probably be required. ;o] So, the question of where the power is coming from for the Saturn or Jupiter systems seems relevant. Are they being powered by Birkeland Currents from the Sun and the Sun powered via the heliospheric boundary acting as a large electron collector and virtual cathode to the sun's anode, with a slow drift of spherically (more or less, probably more tear-drop shaped?) inflowing electrons powering it (glow discharge model)? Or do Saturn and Jupiter themselves collect some fractional bit of the inflowing electrons and/or outflowing ions? Or both? This pair of images shows the planet Jupiter before (left - June 24, 1994) and after (right July 19, 1994) fragments of the comet Shoemaker-Levy 9 struck the planet in 1994. The disk of the planet is in the center of the images. The bright red spots are regions high above Jupiter's "surface" where electrons interacting with the planet's intense magnetic field are producing strong radio emission. These "radiation belts" are similar to the Van Allen Radiation Belts discovered above the Earth in 1958. The pair of images shows the effect of the comet impacts on this pattern of radio emission. A familiar shape, no ? Thanks, its not just me then. (With a nod to Nonnus ). Glenn Orton from JPL has imaged this site using the NASA Infrared Telescope on Hawaii and confirms that it is an impact site and not a localised weather event. I started this imaging session on Jupiter at approximately 11pm local time (1300UTC). The weather prediction was not promising, clear skies but a strong jetstream overhead according to the Bureau or Met. The temperature was also unusually high for this time of year (winter), also a bad sign. The scope in use was my new 14.5" newtonian, in use now for a few weeks and so far returning excellent images. I was pleasantly surprised to find reasonable imaging conditions and so I decided to continue recording data until maybe 1am local time. By 1am I was ready to quit, and indeed I had hovered the mouse over the exit button on my capture application (Coriander for Linux) and then changed my mind and decided to carry on for another half hour or so. It was a very near thing. That's interesting. It doesn't look as "messy" like the shoemaker-levy9 impacts. It seems to be more organized, and the three smaller dark spots are pretty evenly spaced and fanned from the main spot. Odd that no prior cometary displays have been noted, as one would expect from an impactor to create a hole that size. Wacky hypothesis, but what if Jupiter is responding to the changing electrical environment of the solar system, as indicated in the relatively weak output of the Sun. We know from the Bennett relation that the diameter of a Birkeland filament is inversely proportional to current density. Greater current density = smaller diameter, lesser current density = larger diameter. What if the diameters of the current filaments impinging on the sun have increased, and some of the current is now available to Jupiter. Might that help explain the lowered output of the sun? F10 radio flux was about as low as ever recorded just a few days ago. Jupiter's outflow of energy exceeding it's inflow from the Sun is another of those mysteries to mainstream theory. 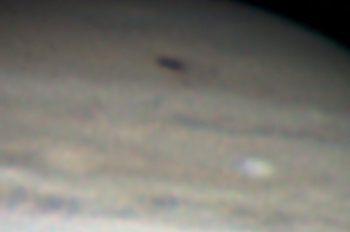 Might Jupiter be scavenging some of the current supplying the Sun? Could this be a Jupiterspot? I'd like to see if Jupiters auroral ring is affected and/or if this dark spot is along the circumference of the ring. It will be interesting to see the morphology of this area over the next few days. solrey wrote: That's interesting. It doesn't look as "messy" like the shoemaker-levy9 impacts. It seems to be more organized, and the three smaller dark spots are pretty evenly spaced and fanned from the main spot. Odd that no prior cometary displays have been noted, as one would expect from an impactor to create a hole that size. From this infrared image you can see clearly where that event in question took place. But what is assumed as a "glowing in IR by a possible impact" (watch, that even NASA isn't quite sure about) could be well what you've been stating. Moreover, watch that the WHOLE SOUTHERN POLE-REGION of Jupiter is glowing in IR too(!) which could indicate indeed that Jupiter is undergoing a stronger "influx" of electrons, "spared" from our Sun and that the "impact" was nothing else than a trace of a concentrated Birkeland, interacting with the gas-giant. I have a sneaking suspicion that [url2=http://www.astronomynow.com/news/n0907/21venus/]this[/url2] is not mere coincidence. In an alert to fellow amateur astronomers, Venus observer Frank Melillo reports on his images captured on 19 July: "I have seen bright spots before but this one is an exceptional bright and quite intense area." The one scenario that all of the end-of-the-world doom n' gloomers have failed to include is one which involves a sudden dramatic surge or drop in the current strength powering this neighborhood. 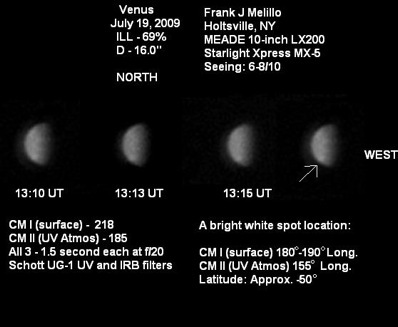 StevenJay wrote: I have a sneaking suspicion that [url2=http://www.astronomynow.com/news/n0907/21venus/]this[/url2] is not mere coincidence. ...An intense bright spot has appeared in the clouds of Venus. Could it be associated with volcanic activity on the surface? The Solar System is breaking out in spots. First Jupiter took a smack from a passing asteroid or comet, manifesting as a dark scar in the Jovian atmosphere, and now Venus is sporting a brilliant white spot in its southern polar region. So again "in the polar region" - exactly where Birkeland predicted. But no "volcanoes" in sight - as "the spot lies outside the region of known volcanoes on Venus.". B.t.w. - what "volcanoes" do they "know" on Venus? Did I sleep too long or have I possybly missed somthing? Furthermore this will put up uncomfortable questions for the "bank-induced global warming(el)ing"